On this episode of Westwood One's Rock Talk With Mitch Lafon. New Interviews with rock legend Alice Cooper, music executive Tom Zutaut, LA GUNS' Tracii Guns and Paul McCartney's Brian Ray. Alan Niven co-hosts. In our first interview, legendary musician Alice Cooper discusses his upcoming tour with Halestorm, fostering new bands, the Hollywood Vampires, his three upcoming albums including a new Bob Ezrin produced 'Alice Cooper' one, Johnny Depp, what is an Alice Cooper album & touches upon Brutal Planet & Dragontown, touring 'bare bones', the physicality of touring at his age, did Detroit's car industry give birth to the revered Detroit Rock scene, writing new songs with Mark Farner, more reunion shows and more. Our second interview is with music executive Tom Zutaut. We discuss Mötley Crüe at length including signing the band, John Corabi, Vince's car crash and the aftermath, Doc McGhee, who ran off with the band's money, copying of KISS on their Shout At The Devil artwork, the Sunset Strip scene, Nikki Sixx, producer Tom Werman, is The Dirt realistic, and more. We continue the episode with Tracii Guns. He talks about L.A. Guns new album The Devil You Know, Nikki Sixx & Bobby Dall and using backing tracks (approx. 1hr 42 minutes), why bother making new music, his guitar playing moving forward, using KISS' Creatures Of The Night producer Michael James Jackson on their Hollywood Vampires album, Eddie Kramer & Rick Rubin getting fired as producers, working with producer Tom Werman, the magic of early albums including Van Halen, fabulous singer Phil Lewis and recruiting him from Girl/Tormé, and much more. Taken from his upcoming live release, A Paranormal Evening At The Olympia Paris, the fan favorite captures the grandeur of one of the biggest rock legends � and a rock 'n'&nbbsp; roll show at its peak. The live album will be released on August 31 via earMUSIC as 2CD digipak, 2LP Gatefold (white and red LP), and digitally. Pre-orders are live here. Last Thursday evening on his radio program, "Nights With Alice Cooper," ALICE COOPER debuted the first single, "Paranoiac Personality" off the forthcoming album Paranormal. As previously announced, Paranormal features two songs written and recorded with the original members of the Alice Cooper band and also has guest appearances by ZZ Top guitarist Billy Gibbons, U2 drummer Larry Mullen and Roger Glover of Deep Purple. The album is out July 28 on earMUSIC and can be pre-ordered via Amazon and iTunes today. There will also be a limited run of blood-red vinyl available at indie retailers across the country. The guitar-driven "Paranoiac Personality" is a perfect entry point to Alice's searing rock record. An album that explores the fringes of society, the end of the world, encounters with the devil and more. Paranormal was produced by long-time collaborator Bob Ezrin (Pink Floyd, Deep Purple). In addition to the new studio album and the two new recordings from the original Alice Cooper band, fans will receive a bonus of six live tracks recorded at one of Cooper's 2016 shows in Columbus, OH. Alice Cooper's North American tour also kicked off this week. He'll join up with Deep Purple beginning in August. Highlights include The Greek in Los Angeles on August 13 and Jones Beach on August 26. Alice Cooper is on a world tour throughout 2017. Full North American tour dates below. earMUSIC is proud to announce the worldwide signing of legendary shock-rocker Alice Cooper. Paranormal, Alice Cooper's new studio album and his first in six years, will be released on July 28, 2017 on earMUSIC as 2CD Digipak, 2LP, Limited Box Set, and Digital. The 12-track album has been recorded in Nashville with long-time collaborator Bob Ezrin and features a very special bonus CD — a mini-album consisting of three brand new songs written and recorded together with the original Alice Cooper band members Dennis Dunaway, drummer Neal Smith, and guitarist Michael Bruce, alongside carefully selected live recordings. Paranormal also features special guest appearances by U2's Larry Mullen Jr., ZZ Top's Billy Gibbons, and Deep Purple's Roger Glover. Alice Cooper will be touring extensively this year in support of Paranormal, visiting cities in the U.S., Europe, and Australasia. 5/16 - Columbus, OH - Express Live! The 1973 return to the band's more hard rock roots was a successful creative choice and catapulted Muscle Of Love into Billboard's Top 10 Album Chart. That sound, complete with the prog-rock/heavy metal workouts, has proven over the years to be a significant piece of the Alice Cooper legacy. Video of ALICE COOPER's annual New Year's Eve gala benefiting the Maui Food Bank.has surfaced online. The event which was organized by famed Cooper manager Shep Gordon was held in a ballroom at the Wailea Mariott in Maui, Hawaii. Alice's powerhouse band, comprised of drummer Glen Sobel, bassist Chuck Garric, and guitarists Nita Strauss and Damon Johnson (filling in for Tommy Henriksen), acted as house band backing up an eclectic line-up of special guests, including Steven Tyler (AEROSMITH), Nuno Bettencourt (EXTREME), Dexter Holland and Kevin 'Noodles' Wasserman of THE OFFSPRING, producer Bob Rock (METALLICA, MOTLEY CRUE, THE CULT), 'Weird' Al Yankovic, Michael McDonald and Pat Simmons of the DOODIE BROTHERS, among others. The event, which was hosted by actor Tom Arnold, has been an ongoing charity show raising money for various organizations for several years now. The night culminated with all artists joining together onstage for a rendition of "Revolution" by THE BEATLES. In episode 46 of One On One with Mitch Lafon, NEAL SMITH formerly of The ALICE COOPER group joins Mitch as well as co-hosts Mark Strigl (from Talking Metal) and the KILLER DWARFS’ Russ Dwarf. In this episode’s only interview, Mitch along with Russ had a lengthy chat with legendary Alice Cooper group drummer, Neal Smith. The topics were varied as Neal discussed his new album KillSmith And The Green Fire Empire, his time with the Alice Cooper group, writing and recording new music, movieprojects, an Alice Cooper group reunion tour & album, and much more. This Episode of One On One With Mitch Lafon is brought to you by the MelodicRockFest 4 � taking place October 3rd and 4th iin Arlington Heights, Illinois and features performance by Mitch Malloy, Heaven’s Edge, 7th Heaven, Talon, Paul Laine, Bombay Black, Johnny Lima and many more. Dallas, TX - July 15, 2014. North American syndicated Rock radio show and website InTheStudio with Redbeard: The Stories Behind History's Greatest Rock Bands presents a tutorial on why little boys shouldn't play with meat cleavers, nooses, high voltage, snakes, and Mommy's make-up and fishnet stockings'unless you plan on going into show business as the King of Shock Rock, Alice Cooper! Rock and Roll Hall of Famer Alice Cooper is on the road and on the big screen this summer, touring with his rock progeny Motley Crue (just one of the hundreds which Cooper inspired), and featured in a new documentary film/dvd titled Super Duper Alice Cooper, so the time seems right for Alice's brand of wrong for InTheStudio. The band Alice Cooper made notorious headlines but few fans when they first appeared on the radio in 1971 with Love It to Death. Alice's stage act then was confrontational, even horrifying, and without the campy humor that would inform the act just two years later on Billion Dollar Babies. But what made Alice Cooper a household name was the savvy string of hits, indelibly changing the rock concert world while revolutionizing American Top 40 radio at the same time with 'I'm Eighteen', 'Under My Wheels', 'Be My Lover', 'School's Out', 'Elected', 'No More Mister Nice Guy', 'Welcome to My Nightmare' and 'Only Women Bleed' from five Top 10-selling albums. The career ride for Alice Cooper careened from the whole band sleeping in one motel room to the covers of Time and Newsweek magazines; from fairways to national airwaves; from rehab to Rock Hall in 2011. 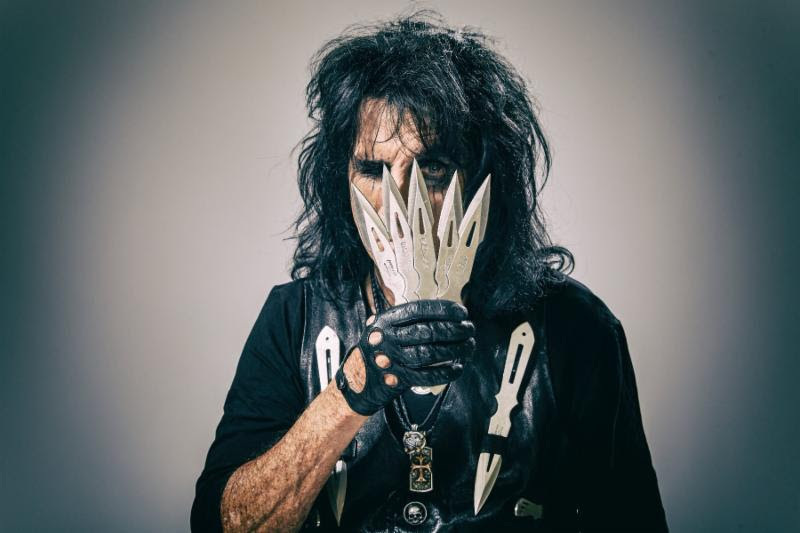 Alice reflects with InTheStudio host Redbeard on why Alice Cooper connected then, and lives on today. New York, NY (July 8, 2014)- Dreams can come true, as rock icon Alice Cooper can attest, following his induction into the White Castle Cravers Hall of Fame at White Castle headquarters in Columbus, Ohio on July 7th, 2014. As a child of Detroit, Alice learned to love White Castle's iconic sliders at an early age, and has never lost his taste for them over the years. He also learned to love rock and roll, and pursue his career in a band, and achieved induction into the Rock & Roll Hall of Fame in 2011. Little did he know that another Hall of Fame, also in Ohio, was in his destiny. Following a tour of White Castle headquarters led by Bill, Marci and Lisa Ingram (the company is a fourth-generation family-owned business), company VP Jamie Richardson conducted a brief chat with Alice in a room full of White Castle employees, including a band that performed some of Alice's songs (he actually JOINED them for "No More Mr Nice Guy," much to their surprise), and then Alice was presented with a plaque commemorating his induction into their White Castle Cravers Hall of Fame. Said Alice, "a lot of my fellow rockers are going to be envious of this honor." Asked how it compared to being inducted into the Rock & Roll Hall of Fame, Alice responded "there's no comparison," carefully ducking the question. The stop at White Castle headquarters took place on a day off during Alice's summer tour as Very Special Guests to Motley Crue on their "All Bad Things Must Come to An End" tour, which plays the Schottenstein Center in Columbus tonight as part of the 72 show run. The summer tour continues through August 31, and then resumes in autumn, October 10 through November 22. Alice has often talked about his love of White Castle in interviews and on his syndicated "Nights With Alice Cooper" radio program, and served White Castle at the party following the premiere of the "Super Duper Alice Cooper" documentary at the Tribeca Film Festival in April in New York City. The documentary, produced by Banger Films (same team that produced the award-winning Iron Maiden and Rush documentaries), has recently been released in both DVD and Blu-Ray by Eagle Rock Entertainment.